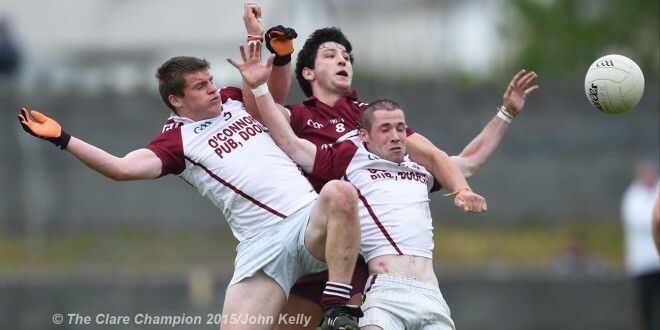 Cathal Doohan scored Lissycasey's goal in their win over O'Currys. Photograph by John Kelly. First round action in the race for the senior football championship title provided plenty of talking points over the weekend. From a major melee at half time in the opening game at Hennessy park in Miltown to three sendings off in the Cratloe v Kilmurry-Ibrickane game at Lissycasey, patrons had plenty of issues for debate not to mention the surprise defeats for Eire Og and Lissycasey. It’s expected that Clare GAA will conduct an investigation into the disgraceful scenes at Miltown as the Eire Og and Ennistymon teams made their way to the dressing rooms. There were no indications during the opening half that a nasty free for all was about to develop but players, mentors and some spectators were involved in the disgraceful incident which marred what was an otherwise very sporting occasion. Goals win games and Ennistymon scored three on their way to a two point win over a fancied Ennis side. The North Clare men were three goals clear five minutes into the second half but from here to the end Eire Og dominated and were just two points adrift when the final whistle sounded. They had enough chances in that closing period to win the game but failed to capitalise. There was another surprise in the second game at the Miltown venue as St. Breckans accounted for Lissycasey. Extra time was required in this one before the Lisdoonvarna club emerged with a merited one point win, 1-14 to 0-16, the only goal coming from veteran and former Clare player Dinny O’Driscoll. From the moment the draw was made there was agreement that the game of the round would be the clash of champions Cratloe who are chasing a third successive title and Kilmurry-Ibrickane. Their meeting at Lissycasey attracted a big attendance and this also produced many talking points with referee Rory Hickey producing yellow, black and red cards during the hour. A goal before half time from Cathal McInerney left the title holders Cratloe just a goal behind at half time and they took control in the opening minutes of the second half when they scored 2-4 without reply. Kilmurry fought back to within two points but Cratloe finished strongly and deservingly won. In the West Clare derby O’Currys had nine points to spare over St.Senans Kilkee while Kilrush had eight to spare over St. Josephs Doora-Barefield. Elsewhere Cooraclare had one point to spare over Wolfe Tones while Clondegad had their expected win over Shannon Gaels. The remaining game between Doonbeg and Miltown will take place on Saturday next. In the intermediate championship first round, Kilfenora defeated Kildysart and Kilmihil overcame Liscannor while the meeting of Corofin and Naomh Eoin ended in a draw.